Photo by Linden Hudson taken near the ocean in Texas USA. 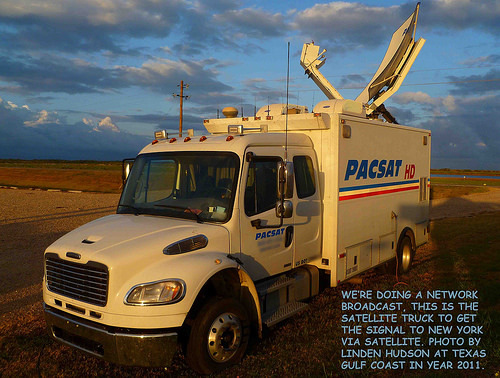 This is a remote television satellite truck. Honey, what about the pig? 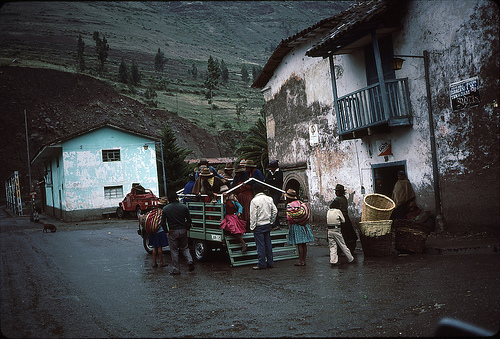 This is a picture I took back in 1984 while I was living in Cusco, Peru, for one year as an exchange student. I chose not to dust the slides (oops, mistake!) so, well, they’re kind of dusty! I don’t remember what town this was in, but it was certainly in the province of Cusco… maybe on the way to or from Urubamba. This was a common form of transport in Cusco. No me acuerdo en qué ciudad estuvimos, pero creo que estabamos de vuelta a Cusco de Urubamba o tal vez de Pisaq. I love the fact that I used to live in a place where pigs just roamed the town! I didn’t actually live in this place, but I lived it Cusco, which is within an hours drive from wherever this was taken. 11/14/07 I have this picture up as my desktop right now… when I got home tonight after class I turned my computer on and was admiring the pig. It struck me that most people that I know probably didn’t ever live in a place where pigs roamed the streets! While I was looking at this picture, I noticed the landscape and how much it looked like it would have lots of landslides. Then I remembered from my studying for my Geography exam last week that the Andes mountains are volcanic mountains, i.e. that they were formed by volcanic action. Then I thought about how many Earthquakes they have because of being a volcanic place… and THEN I was thinking about El Sen~or de los Temblores (god of earthquakes)… and then, I logged out of flickr and went, uncharacteristically, to CNN and there was a picture with a caption about a 7.7 earthquake in northern Chile. I thought "Wow…" Why? Because I had just been thinking about Our Man of the Earthquakes moments before and there it was in the headline of CNN’s main web page. I heard this truck coming down the road and immediately turn my camera so I could catch the truck and the dust on the road. Had to do some adjusting to the F stop so was only able to get off two shots. This was the better one. Not much traffic on these narrow gravel roads, but coming up here we almost met a bigger truck head on that was traveling at a ridiculous speed for the condition of the road. I pulled over and waited for him to pass. Guess he was anxious to get home, or somewhere. These are huge compared to the ones in central CA — at Altamont Pass. "The blades are mounted on a housing unit the size of a minivan and sit atop a massive tower about 165 feet high. 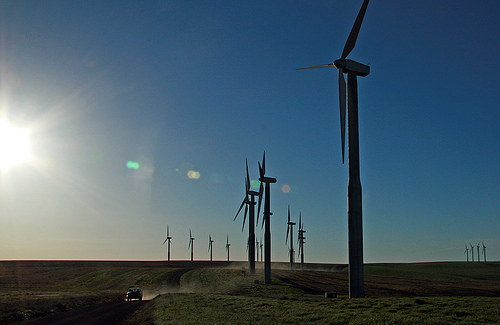 Wind propels the blades, which turn a shaft that drives a generator. The electricity goes to an underground distribution line, where it is carried to the main substation. The blades need a minimum wind of 7 mph to turn and start generating electricity at 9 mph. A computer shuts down the turbine if the wind reaches 56 mph." "Each windmill has a footprint of about 40 square feet, which means much of the land remains useful for agriculture and grazing. ‘The cows can go right up and lean against them,’ Brown said." 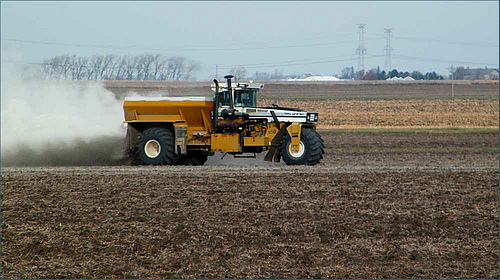 From time to time a field needs to have lime applied to it to keep the soil fertile. 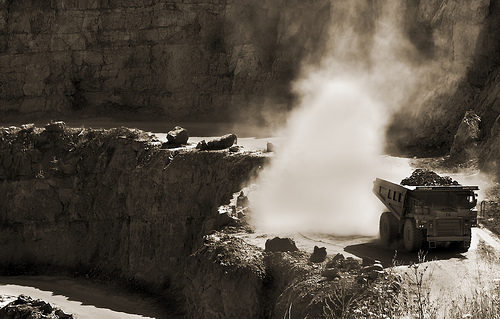 This is the machine used to apply (dust) the field. The driver really only has to steer and reload since the application is computer controled and depends on the "speed over ground" to set the rate of application. This was shot using the full Zoom of my camera.. 15x..